It’s a classic Chicago contrast of destruction and regeneration, one that will come into sharp focus Monday as the Cubs play their home opener at historic Wrigley Field. A few blocks south of the ballpark, backhoes have been tearing into decades-old buildings along Clark Street. They’re clearing the way for a new elevated structure that’s supposed to unclog bottlenecks on the city’s busiest transit line, but could also loom like a freeway above homes and shops. Meanwhile, new structures are altering the urban confines of the Friendly Confines, at once making its surroundings more inviting and more crammed. The developments, whose combined cost exceeds $3 billion, amount to a high-stakes urban design drama whose impact will resound for generations throughout the city’s North Side. Together, they could fuel a new era of growth in already-vibrant Wrigleyville and neighborhoods like Uptown to its north. Or they could scar the very heart of Wrigleyville with the new elevated structure and erase its quirky, human-scaled charm. The outcome will speak to an issue that resounds far beyond Chicago: Whether public officials can effectively manage the growing phenomenon of “transit-oriented development,” which encourages high-density construction near transit and commuter rail stops to cut down on car use and save energy. Transit-oriented development — TOD, for short — may sound good in theory, but some developers use it as an pretext for bulked-up buildings that are over-sized eyesores and dwarf their delicate-scaled neighborhoods. Examples now blight the otherwise attractive downtowns of suburbs like Wilmette and La Grange. Unfortunately, that’s not the worst-case scenario that could arise from the CTA’s demolition of 14 structures as part of its $2.1 billion push to modernize the Red and Purple lines. The worst case is no development at all on the lots left vacant by the demolition, which would leave residents and businesses exposed to the racket of the “L” and a track structure that, at its apex, will be 45 feet high — double the elevated’s current height. CTA officials say the chances of that happening are remote, but their real estate development track record is hardly spotless. Consider the handsomely restored Gerber Building, a Beaux Arts gem at the agency’s Wilson Avenue Red Line station that reopened last fall. Its retail space remains depressingly empty. CTA spokeswoman Tammy Chase said in an email that the agency is still seeking to nail down a tenant. 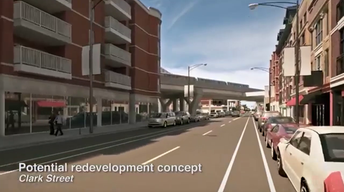 By virtue of their location near or next to the Addison Street elevated stop, the new developments around Wrigley Field qualify as transit-oriented. And they show the pluses and minuses of the approach. According to team spokesman Julian Green, the Cubs’ owners, the Ricketts family, are spending nearly $1 billion on the renovated ballpark, the outdoor plaza called The Park at Wrigley, a six-story office building for the team and the just-opened seven-story Hotel Zachary. The multi-year transformation is scheduled to wrap up in 2020. Designed by the Chicago office of Edmonton, Alberta-based Stantec, the new structures are not brilliant architecture, but they are positive additions to the cityscape, replacing ugly surface parking lots with street-defining buildings and the lively plaza. They also are appropriately deferential to Wrigley, with generous setbacks that echo the wedding-cake design of the iconic ballpark and ensure they don’t crowd it. The picture is very different at a mixed-use development south of Addison Street, called Addison & Clark, that will include apartments, shops and a movie theater. Backed by M&R Development and Bucksbaum Retail Properties, with a design by Chicago architects Solomon Cordwell Buenz, the eight-story project has a reported price tag of more than $150 million. At its 2016 groundbreaking, Mayor Rahm Emanuel and Ald. Tom Tunney, 44th, lauded it as ideal example of transit-oriented development. As built, however, the project fulfills the prophecies of those who warned that it would be a looming presence. Along Addison, its main setback is too high and too shallow to make it a good neighbor to Wrigley. Facade materials may lessen this effect, but only so much. Wrigley once rose majestically, like a medieval cathedral, above the humble jumble of three-flats and stores that rimmed it. This contrast, an essential part of the ballpark’s beauty, is now compromised by the cumulative impact of the new buildings around it, particularly Addison & Clark. Wrigley is a strong enough presence to survive that challenge, but Emanuel and Tunney need to stop, take stock, and ensure that future construction around the ballpark doesn’t further mar its landmark presence. Also potentially at risk is one of the main gateways to Wrigley — the raucous row of bars, restaurants and sports gear shops that line Clark Street south of the ballpark. No one would ever call them polished. Some would even call the bars (or, more accurately, the drunken revelers who emerge from them) a threat to public safety. But this row of buildings is as much a part of the Wrigley experience as the three-flats on Waveland and Sheffield avenues. There is every reason, then, to take a hard look at how the CTA’s Red Line-Purple Line modernization project will affect the raffish strip and the quiet neighborhoods around it. The centerpiece of the $2.1 billion project is a ramp, called a “flyover,” that will let northbound Brown Line trains sweep over southbound Red and Purple Line trains north of the busy Belmont Avenue station. The CTA says the flyover will allow it to run more trains, cutting delays and overcrowding. The project will also remake stations, bridges and track along a century-old corridor between Lawrence and Bryn Mawr avenues on the Red Line. While construction is supposed to start in late 2019 and be complete by 2025, the agency has yet to select a contractor or issue design guidelines for the bypass. But it has asked Solomon Cordwell Buenz to hold community meetings to plan development on vacant sites along the flyover and the refurbished stations. The CTA has also posted online videos that show idealized, conceptual versions of the completed bypass. In the videos, the sky is blue, the sun shines and new buildings magically replace vacant lots left by the current round of demolition. “As soon as those sites are ready and construction is complete, there’s a game plan in place,” said Christine Carlyle, director of planning at Solomon Cordwell Buenz. By 2025, she predicted, the cluster of entertainment attractions around Wrigley will help lure developers to the small sites along the bypass. “There’s going to be a lot of good synergies in that area,” she said. To some businesses and residents, however, the prospects are hardly so bright. They worry about the interim period when they’ll be living and working in a construction zone. “It’s definitely going to put a damper” on business, said Kevin Grossett, owner of the Irie Jerk Bar & Grill at 3404 N. Clark, which sits just north of planned flyover. “It looks like a freeway,” she said of the flyover. By starting the community planning process, the CTA has at least signaled that it views the Red Line-Purple Line modernization project as an exercise in urban design, not just transportation. It would be even better if the agency were to aim higher and insert the word “placemaking” in its development standards for the project. Wrigleyville and the neighborhoods around it are, above all, memorable places. The first order of business should be to do them no harm and ensure that new buildings are compatible and the bypass touches the ground lightly. God, as always, will be in the details, which is why it’s equally essential that the CTA push contractors hard to make the flyover as visually unobtrusive as possible. That won’t be easy with a concrete superstructure that towers so high. So the CTA and the city’s Department of Planning and Development need to use every tool at their disposal to ensure that, once construction of the flyover is finished, development occurs quickly, shielding adjacent properties from the bypass. Yet getting the development right matters just as much. To retain Wrigleyville’s character, small-scale projects occupying single lots will be preferable to multi-lot blockbusters. City officials should also dangle the carrot of incentives to promote the construction of affordable housing. The development that accompanies the Red Line-Purple Line modernization should create districts that are as equitable as they are vibrant. For more than a century, from the World’s Columbian Exposition of 1893 to Millennium Park, Chicago has demonstrated the capacity to think big and execute with elan. But its “make no little plans” narrative also must include such horrendous mistakes as its now-demolished high-rise public housing projects. For the big transit-oriented developments in and around Wrigley to succeed, we need to reset our sights — on the local as well as the citywide, on the granular detail as well as the grand gesture, and on creating memorable places as well as moving people safely and efficiently.